I attended the latest DUETs meeting yesterday and was delighted to see the progress being made. Iain Chalmers and Muir Gray refer to the National Therapeutic Ignorance Service – highlighting the significant number of uncertainties in clinical practice. Perhaps the most significant development will be the move, for DUETs, into the National Knowledge Service and close links with the NLH’s specialist libraries. Muir was very strong in his support for highlighting uncertainty/ignorance. It may be too soon to hope that clinicians will enthusiastically embrace uncertainty, but things are beginning to change. So DUETs will continue , highlighting and recording ignorance as it grows. My involvement started around 2 years ago with a meeting with Iain to discuss the ATTRACT service and unanswered questions. I highlighted my favourite unanswered question – what is the optimal frequency of vitamin b12 injections in pernicious anaemia? In the UK these are given every 3 months and in North America it is typically monthly. However, there is no trial evidence to support either position. Still no answer to that Q though….. 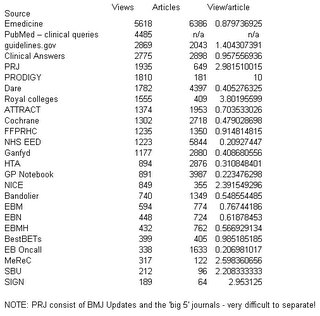 In yesterday’s post I showed that eMedicine article were viewed the most. 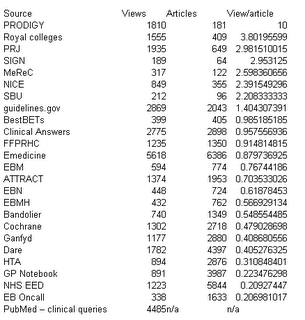 However, I feel that’s misleading, as eMedicine has lots of articles so are more likely to have a broader appeal. I suspect eMedicine is viewed more in esoteric areas not much covered by mainstream ‘evidence’. So is eMedicine the top site? I don’t think so! Occasionally, this is the 4th time in nearly 4,000 questions, an answer from the NLH Q&A Service got rated ‘poor’. So that’s only 0.1% – but it still upsets me. The reason though for us doing badly? It was a question about p-Phenylenediamine (PPD), which is often used, in henna tattoos (popular in the UK). The general practitioners (GPs) patient developed a severe allergic reaction and so wanted to know what other products PPD appears in – to help guide the person away from future allergic reactions. The problem being that the Q&A services answer questions of the type answerable by research evidence, by searching the likes of TRIP, Medline, Cochrane etc. This question I beyond our remit and expertise. So, trying to be helpful, we ‘answered’ the question – badly – just because we tried to help. The lesson to learn is to know your limits and sometimes trying too hard can backfire. The outstanding question now is – do we leave our poor answer up there and hope people will help us out? Less than a month since the launch of the free service and we’re already planning our first algorithm improvement. This has come about by the observation that eTextbooks are appearing too high up in the results. TRIP is principally about returning best evidence. As such eTextbooks have a role. However, they should generally appear below other evidence sources. The problem of them appearing so high up has been caused by the perfect match between search terms and eTextbook document titles . Typically users use a single search word (or phrase) to search TRIP. eTextbooks typically use single words or phrases in their title. So they score highly for title matches. In other words if someone searches for ‘Asthma’ a document just called ‘Asthma’ gets a significantly higher score than ‘In children with asthma what is the appropriate management’. In the first example its a 100% match, in the 2nd it only matches 11%. we’ve tried various techniques to dampen this effect but now is the time to get the programmers in! Hopefully the new algorithm will be tested and released by mid-October. Is there any benefit in prescribing statins in the elderly? What is the frequency of vitamin b12 injections in pernicious anaemia? We answer these as best as the service can. However, we can only report on the evidence. If the evidence isn’t there or is abstractly written our answers reflect that. Is a medical Wikipedia a good idea? Just came across this post. Mentions Ganfyd and includes a comment from Ganfyd’s Adam!